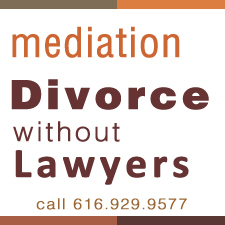 With mediation you and your spouse – with or without your lawyers – meet with Patricia Riley who will be serving as your mediator. The mediator is a neutral professional. The mediator is the guide through a maze of conflicting emotions, questions and disputes, keeping you and your family on the track towards resolution. With mediation, you resolve your issues without court intervention, which can be a tremendous cost saving. Litigation is an expensive process, and Mediation has a very different approach. Your discussions are private, the atmosphere is comfortable and informal and the process is empowering and efficient. Mediation with this mediator is a little different because disclosure, honesty, fairness are not optional. When divorce happens in a family, the money gets tight. The budget that used to support one family is now called upon to support two households. The costs of some divorce trials are legendary – even a short hearing can consume many hours of legal fees in preparation, document control, research. With mediation your assets remain more available for your own family. In the real world accomplished divorce lawyers request upwards of $ 3,000 as a retainer — which is only a start. The standard is $5,000. A good healthy custody battle will cost upwards of $ 15,000. Mediation will cost a fraction of that amount. In divorce hearings, division of your assets and obligations, and decisions concerning your children are made by the Family Court judge – who is a stranger to you and your family. How much better for your children if such decisions are made by the parents, people who know the individual strengths and weaknesses. As responsible and reliable as the Judge may be, he does not know you, and you are one of many on his desk that day. To assure a thoughtful resolution, you can use mediation. In mediation the exchange of information is confidential and protected. You can consider and discuss options without fear that your statements or questions might be used against you in Court or elsewhere. Your family business remains just that – family business. Divorce hearings can take months. The courts are sometimes backlogged, and it is difficult to get sufficient time in court scheduled to properly outline your situation to the Judge. In mediation it is just a scheduled meeting like any other. Rather than spending months waiting to “have it over” you can have your own agreement drafted in a matter of weeks. Divorce is very tough on children. They love both parents, and the longer the divorce takes, the more anxious the parents become, the harder it is on the children. In mediation you can reach a resolution letting you preserve control of your own children’s schedule and arrange for their support in time to let them go back to school or sports. The sooner the parents have it resolved, the sooner the children will be able to rebuild their own lives. Give yourselves and your kids a break, and get it settled. My rule is fairness. You will not be happy or joyous, but it will be fair.